Learn how to track your time inside Basecamp, Asana, Trello and more with the TrackingTime Extension for Chrome and Firefox. 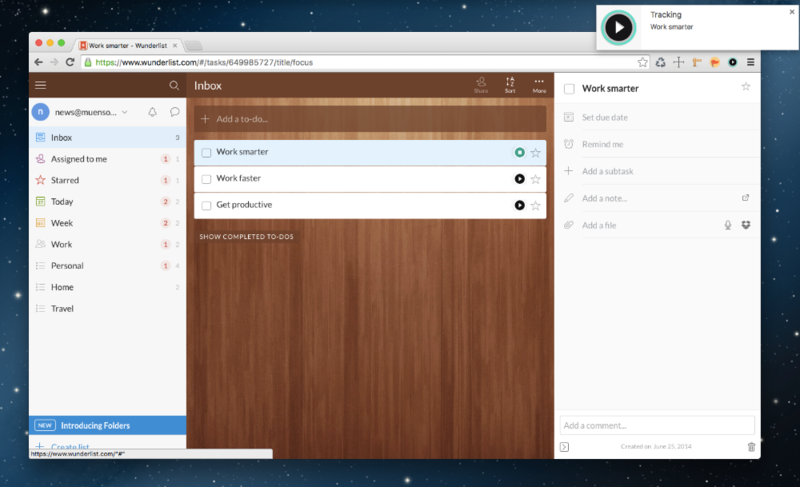 Track your time right within your favorite productivity web apps. Get the TrackingTime Button for Chrome or Firefox here and track your time in more than 30 popular online services like Basecamp, Asana, Trello, Gmail and many more! The TrackingTime Button is a browser Extension for Chrome and Firefox that allows you to add time tracking to your favorite productivity tools. It's seamlessly integrated within the UI of the business apps you love and use every day. All tasks you and your employees track are automatically synced with your TrackingTime account. Open this link in Chrome or in Firefox to download and install the extension. Once installed, the TrackingTime Button will appear in your browser toolbar. 2. Click on the extension icon to log into your TrackingTime account with your email and password. Don't have an account yet? No Problem! You can create one for free. That's it! Now, the TrackingTime Button will magically appear inside your favorite productivity apps. Go to your Basecamp, Gmail, Trello or Jira account and start tracking your tasks. The best part about the TrackingTime Button is that there is no setup required. It just works. When you start tracking a task inside Basecamp, Asana, Smartsheet or any of the supported apps listed below the Button will automatically identify the task and project you've selected and sync this data in your TrackingTime account. If the task (or project) doesn't exist in your account yet, we'll automatically create them on-the-fly using the names we detected. How we try to detect the right task and project names varies depending on the app you're using. For instance, if you're using a task management app like Todoist, Asana or Trello we'll match projects and tasks in TrackingTime. If you're using Gmail there is no project information available. So in this case, we'll just create a task in TrackingTime using the title of the selected email as the task name. Please keep in mind that if you change the original name of a task or project these changes won't be automatically propagated to your TrackingTime account. To continue tracking time on the same updated task you should also change the name in TrackingTime. Currently, the TrackingTime Button works with the following business applications and online services. Didn't find your favorite productivity app on the list? Please get in touch with us and let us know which app you'd like to integrate TrackingTime with.